Meet the beautiful Honey... this isn't the first time I've had the honour of painting this lovely lady, I previously painted her alongside her good friend Barney and I was thrilled to be asked to paint her again as a Christmas present for her parents. As you can see from the picture she has such a gentle nature and this is what I wanted to capture in her portrait, the painting is done in oil on canvas. 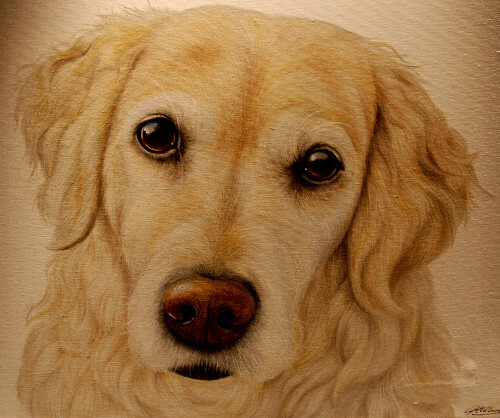 "I've given mum n dad the picture of honey you did and they've started crying, they love it so much clever munchkin you are"
Although I don't enjoy making people cry its always great to know that my work is appreciated and treasured!